There’s a reason why MLB Players such as, Manny Ramirez, Tony Gwynn, and Giancarlo Stanton, train with the CamWood Training Bats, they flat out work. A player should always train with the same length baseball bat that he plays with. For example, if he hits with a 32-inch bat, then he should train with a 32-inch bat. The extra weight is distributed in such a way that it is effortless for even an 8-year old to swing a 34-ounce bat. Think of holding a sledge hammer by the head rather than the handle. The redistribution of weight makes it seem much lighter. 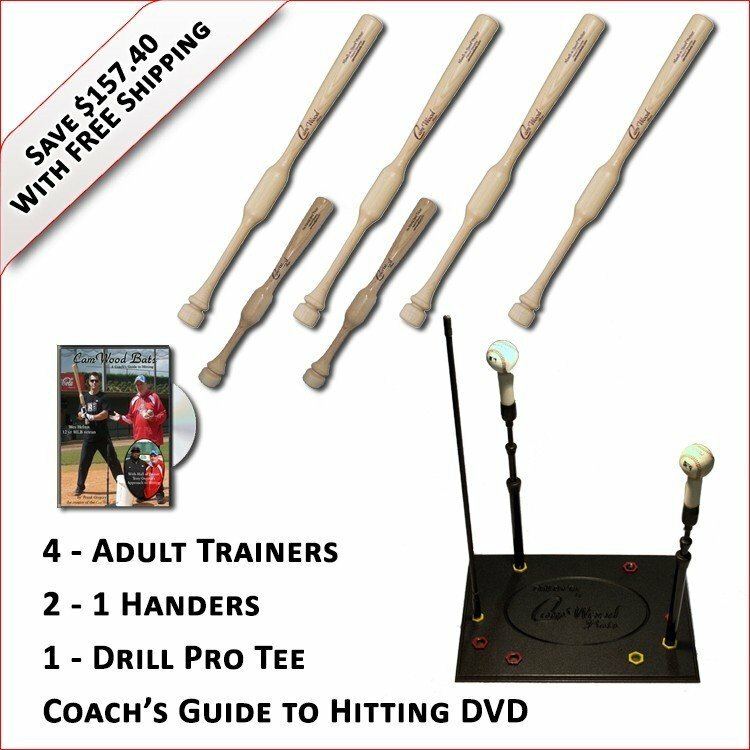 CamWood Training Bats and One-Hand Trainers are the fastest and easiest way to teach the proper baseball and softball swing. Other heavy bats put all the weight at the end of the bat which causes a player to break down his mechanics and causes him to cast the bat around the hitting zone. With the CamWood Training Bats the weight is placed down by the hands. This unique design has two great benefits. It helps the player by aiding him to drive his hands inside the ball simultaneously with making him stronger and developing bat speed and power. With a marine grade polyethylene base and powder coated galvanized steel, the CamWood Training Tees are the most durable that you can train with. The CamWood baseball and softball Hitting Tees are the only tees that actually teach a player the proper bat bath to the ball. Unlike all other tees that just allow you to hit a ball, the CamWood tees are designed with a purpose. The Insider Tee, with its perfect rod placement, forces the player to keep the bat inside the ball. As you swing the bat inside the rod, the sweet spot of the bat is automatically put in line with the ball. The Drill Pro Tee is the most versatile tee a player can use. Just like to the insider tee, it comes with the rod to teach the proper bat path. It also comes with two hitting stems, which allows the player to do multiple drills. This training bat is absolutely the best way to teach the proper swing. After using it as head coach of SDSU, we raised our batting average 67 points while tripling our home production. Frank, this will be my 4th year using these and this past year we enjoyed our best season in my tenure. We lost in the Class 2A-Region 3 Championship game 3-2. In Texas this is the last game before the State Championship Tournament in Austin, Texas. Only 4 teams in Texas advance to the State Championship Tournament. The majority of my girls are under 5'4 and weigh less than 150 pounds yet we broke and set 9 new offensive school records this year alone. I believe that these bats have played a large role in our success. I would like to see you in Texas sometime selling your products at our coaching schools. We love our baseball and softball in Texas. I have recommended your products to many of my friends. I add a little extra to the bats by swinging them with Golds Gym weighted gloves. It adds a pound and a half to each hand. We get compliments everywhere we go on how we attack the pitch. I have a 5'0, 120 pounder that swings out of her shoes every time. I love it. Hopefully we will break through this year and if we do we will make sure we send you a team pic. Thanks for everything you do!! View Our Testimonials to find out what people are saying about the CamWood Training Bat.